Construction trades union members Martin Alvarenga (right) of Glastonbury and Steve Frantz of Essex rally outside the Legislative Office Building for more state spending on transportation. The State Bond Commission approved $10 million in financing Wednesday for an analysis of establishing electronic tolling on most Connecticut highways. After a nearly hour-long debate, the 10-member commission voted 6-3, with one abstention, to approve the funding proposed by Gov. Dannel P. Malloy. Without a major infusion of revenue, the transportation program will lack the resources to launch major highway projects planned for the coming years, Malloy said, including: repairs to the elevated section of Interstate 84 in Hartford, reconstruction of the “Mixmaster” junction of I-84 and Route 8 in Waterbury, and widening of major highways. Gov. Dannel P. Malloy talks with reporters following Wednesday’s State Bond Commission meeting. The Democratic governor, who is not seeking a third term this fall, charged his Republican critics with trying to stifle a crucial debate in a state election year. He noted that in recent years the state has approved $11 million to fix a bridge in Derby, the home community of House Minority Leader Themis Klarides, and $2.5 million to improvements to an East Haven trolley museum in the district of Senate Republican Leader Len Fasano. Department of Transportation Commissioner James Redeker estimated tolls could raise as much as $1 billion per year, with up to 40 percent coming from out-of-state motorists. Depending on the level of discounts provided to in-state residents, though, the state’s annual take could be closer to $600 million to $800 million. DOT officials also have estimated it would take four to five years to fully implement tolls if they were authorized. Wednesday’s vote does not do that. It also provides funding for a study. Authorizing tolls would require an act of the legislature. Besides the governor, others voting to fund the tolls study included: state budget director Ben Barnes, Deputy Department of Administrative Services Commissioner Toni M. Fatone, Attorney General George Jepsen, Sen. John Fonfara, D-Hartford, and Rep. Jason Rojas, D-East Hartford. 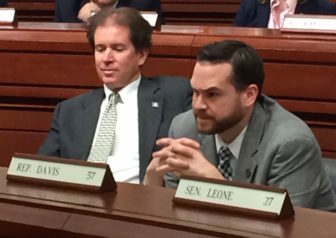 The two Republicans on the bond commission, Sen. L. Scott Frantz of Greenwich and Rep. Chris Davis of Ellington, joined state Comptroller Kevin P. Lembo in voting in opposition. Davis and Frantz both noted the General Assembly opted not to authorize a tolls study this year. A bill to do so died on the House of Representatives’ calendar when the session ended on May 9. “That’s what we have heard time and time again from the people of Connecticut: They don’t see a need or a desire to have a $10 million study,” Davis said. Redeker told the bond commission that a Republican plan to finance transportation work without tolls also would leave Connecticut unable to do little more than highway and rail maintenance work. Fasano also said transportation officials did not offer that view when Republican legislators first briefed them on their plan in 2017. Lembo was the lone Democrat to vote against financing for the tolls study. 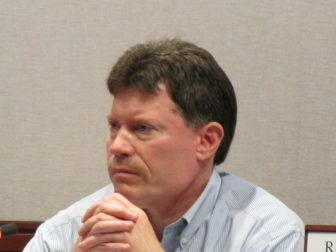 Lembo was the only constitutional officer on the bond commission seeking re-election. And while the comptroller did not raise the campaign as an issue, other Democrats questioned privately whether Malloy had hurt his own party by putting an unpopular issue before the public in an election year. Democratic gubernatorial contender Ned Lamont issued a statement before the bond commission meeting even had ended, calling the study “a wasteful way to reinvent the wheel.” Lamont noted the state had commissioned a study in 2009, though Redeker said that analysis was more limited in scope than the latest one would be. 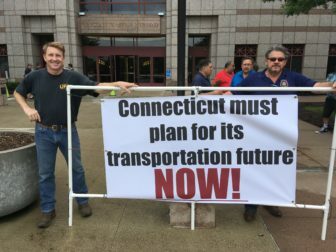 Move CT Forward, a coalition of Connecticut construction industries and trades involved in transportation projects, has been a frequent ally of Malloy in recent years as the governor has sought more funding for transportation projects. And while the coalition sent about 100 people to the Legislative Office Building on Wednesday, organizer Don Shubert, president of the Connecticut Construction Industry Association, said the group was rallying for more transportation projects — but had no position on the $10 million tolls study. Fonfara, who is seeking re-election but represents one of the safest districts for Democrats in Connecticut, said “too often we make political fodder out of issues that get a quick response from the public,” such as tolls. But while the questions of tolls sparked a fierce political debate, administration officials also said most of the $10 million might never be spent on a study. Both the governor and Redeker estimated it would take roughly nine months to solicit proposals for a transportation consultant, and to make a contract award. That would happen, tentatively, in April 2019, roughly three months after Malloy had left office. That means the governor’s successor easily could block the study simply by directing the DOT not to enter into a contract. 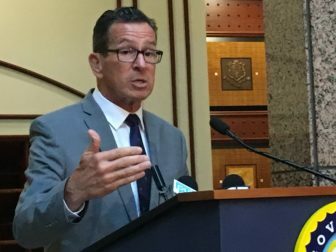 In that event, Malloy said, only a small portion of the $10 million would have been spent to advertise and invite interested consultants to bid on the project. State Treasurer Denise L. Nappier, who serves on the bond commission, abstained from Wednesday’s vote , saying she would have supported funding for a broader study. “I do … question whether tolls ought to be considered in isolation when there are a myriad of other financing options” to pay for transportation improvements, she said. These include fuel tax increases as well as public-private partnerships.